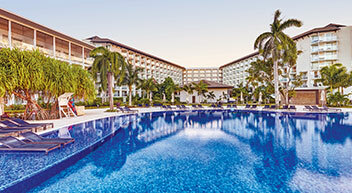 Get up to $600 in resort coupons at Royalton Luxury Resorts. Book a flight + hotel package at Royalton Luxury Resorts of three nights or more, and enjoy up to $600 in resort coupons.^ Use your resort coupons towards room upgrades at the time of check-in, wine purchases, and the Royal Spa. Amount of the resort coupons varies depending on the room category booked. 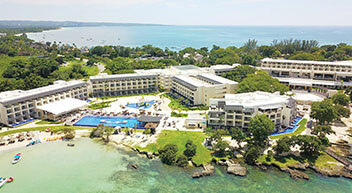 Come and enjoy an All-In Luxury® experience at Royalton Luxury Resorts. Located in some of the world's most popular tropical destinations, Royalton all-inclusive resorts provide a unique experience with stylish architecture accented by local flair, luxurious modern amenities, personalized service, and attention to detail. Stay connected during your stay with Royalton’s All-In Connectivity™. This value-added benefit provides WiFi access throughout the resorts, unlimited free in-room calling to North America and most of Europe, USB charging stations, and in-room Bluetooth speakers. Delight your culinary senses with delectable à la carte specialty restaurants as you please without needing a reservation. Watch top sporting events live at the resort with the Sports Event Guarantee™. Plus, kids and teens alike will be entertained by innovative age-appropriate programs, on-site splash-pads, and state-of-the-art facilities. Offering a variety of bars and entertainment, including a sports bar, martini bar, swim-up bar, and a disco. All-new program featuring fitness and wellness classes and a host of value-added inclusions. Unique programming for children and teens. New hotel! Opens April 2019. Located in the vibrant Cancun Strip, one of the most popular locations for beachfront getaways and an unrivaled nightlife. The Rooftop SkyClub offers an exclusive pool and elegant cabanas. Gorgeous Swim Out room categories. Stunning casino with slots and table games. Access to one of the largest water parks in the Caribbean. 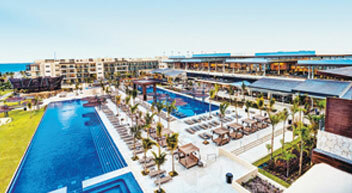 Exchange privileges including use of restaurants and pool areas at Grand Memories Resorts & Spa. World-class dining with chef-curated menus. On-site splash park, a fun-filled lazy river, a surf machine, and a 9-hole mini-golf course. No reservation, dreamy poolside Bali beds. Access to the on-site water park with splash pad plus a lazy river at adjacent Royalton Blue Waters. Luxury poolside private cabana rentals. 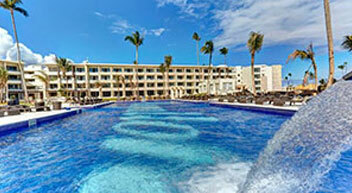 Exchange privileges including use of restaurants and pool areas at Royalton White Sands. Round trip flight via Southwest Airlines® to Cancun (CUN), Riviera Maya via Cancun, Punta Cana (PUJ), or Jamaica via Montego Bay (MBJ). ^Get $600 in resort coupons in Diamond Club room categories or $300 in non-Diamond Club room categories. Use your resort coupons towards room upgrades at the time of check-in, wine purchases, and the Royal Spa. Additional details will be provided upon hotel check-in. 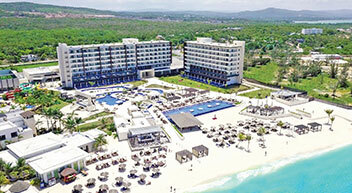 The resort coupon offer at the new Royalton Cancun Resort & Spa is valid for travel beginning on 4/1/19. Resort coupons cannot be exchanged for cash. There is no cash reimbursement if unused. Resort coupons promotion is not combinable with other coupons or credits; discounts; or promotions unless specifically indicated. Resort coupons are not transferable, non-cumulative, and cannot be held over for future stays. Promotion, prices, and applicable services are subject to change without prior notice.